Unbelievably, its now mid February, pitchers and catchers are reporting to Spring Training … and the two best FAs and two of the best players in the game remain unsigned. If there was ever a sign that baseball’s collective pay system is broken, we’re seeing it. An amazing combination of tanking, salary cap, poor CBA negotiating and GMs too smart for their own good has the game barrelling towards a large, ugly work stoppage in a few years time. But we have to get there first. How many games do you think this team wins? Catcher: Matt Wieters starting with A.J. Ellis backing him up (post publishing correction per comments; Ellis has retired so we’ll go with Evan Gattis as the backup/DH). Poor defense, but halfway decent offense based on 2018 numbers. 1B: Logan Morrison: he fell off a cliff in 2018, but had an OPS+ of 133 in 2017. Bet on a rebound. 2B: Josh Harrison. 2 time all star, solid player. 3B: Mike Moustakas: four straight years of above MLB average production. LF: Carlos Gonzalez: would you bet against CarGo with a chip on his shoulder? Utility: Marwin Gonzalez: can play 6 positions, hits the ball and isn’t 30 yet. Why is he still a FA? Lots of power potential here: I’d go Harrison, Machado, Harper, CarGo, Jones, Morrison, Moustakas, Wieters and Pitcher. That rotation is better than 10 teams’ rotations right now. Is that a lot of talent still waiting to be signed? I think so. I still count at least 15 starters who could impact nearly any team in the league on the bench. its just crazy. Subscribe to comments with RSS or TrackBack to 'Pitchers and Catchers reporting for 2019 … here’s an “all FA Team”'. I’d bet that team would win around 70-75 games. The starting pitching in particular would be well below average, maybe better than 10 teams (many of which are tanking) but still objectively pretty bad. Based roughly on what these guys either made last year or are publicly demanding in contract talks, your payroll would be north of $200 million — among the top 2 or 3 in the league — for a below-average team. I think this thought exercise actually validates the GM’s thinking and what’s happening in baseball right now: the cost of signing free agents far exceeds their player value, and is causing everyone to shy away. A.J Ellis has retired. He’s now in the Padres front office. I knew i’d screw up at least one name: that link is a few days behind and some of the names on it have already signed. NG: probably true that this validates GM’s thought processes. But it also highlights how out of whack things have become. Players need to figure out how to get Mookie Betts paid like the best player in the game, while he’s the best player in the game, if GMs aren’t going to hand out 8figure AAV deals for players in their 30s. Like, I think the players need to blow it up. No more arbitration, no more 0-3 years of control. Its destroying them. Right. The current labor agreement is basically based around an implicit deal between the owners and the players that players will be underpaid at the beginning of their career and overpaid at the end. This is bad for the players in a couple ways. One is, the majority of the players have short careers and never get paid. And two, what we’re seeing now, the owners and GMs are wisening up and saying, why should we overpay for anyone if we’re not required to. On the flip side, I think it would be bad for both players and teams if you don’t have some level of team control. Part of what draws fans to the game is rooting for players on their team. If you have no “home grown” stars that becomes a lot harder, and while in the short run players would probably be paid more, the long run would hurt because some fans would lose interest in the game. You could certainly start arbitration earlier, perhaps even after year 1 or 2. I don’t know the specifics, but I’ve read that arbitration is basically trying to get the player 60% of free agent value in arb year 1, 80% in year 2, and 100% in year 3. That’s really what you attack if you’re the players — players should be earning “fair market value” ASAP. I also think the players should seriously consider trading a hard salary cap for a relatively high salary floor. The Oaklands and Tampa Bays that don’t pay anybody distort the player market a lot. If starting in 2023 every team had to spend at least 120M on payroll, that would add a lot more to the player’s coffers than they get today. NG: definitely agree. You can make a cogent argument that the players have lost more than $600M in total salary over the past couple of years thanks to a lack of a floor to go along with the ceiling that they paid no attention to. Arbitration estimates generally go 40%/60%/80% for standard 3 year arb cases …for 4th year guys that last year turns into more like 90%. But yes the point is clear; after 3 years of pre-team control where players earn small fractions of what they’re worth .. then they’re fighting tooth and nail for 40% of their open market value? Its ridiculous. Especially since players toil in the minors for 3-4 years getting paid less than minimum wage. Which, by itself, is a complete f*cking disgrace frnakly and I can’t believe there’s not more outrage over the blatant lobbying done by team owners to ensure that minor league talent gets paid nothing. You could take one $10M/year salary for a veteran player and split it among 200 minor leaguers (a quick estimate of how many minor leaguers a franchise generally carries among 6 levels) and increase everyone’s salary 50k. That’s not a lot for teams who are making hundreds of millions in revenues and have franchise values in the billions. – increase minor league salaries: you just cannot make an argument to me that $1200/month is a legitimate wage. – lower arb years and/or replace with a form of restricted free agency. As you said; this whole ridiculous system was based on an implicit deal that is now not being met … so the players have to fight so that they get to FA while they’re still in peak earning mode. Yes to all. And the players really have themselves to blame for a lot of it for focusing on the wrong things (QO penalties) in the CBA negotiations. But not all of it. Baseball for a long time has had a problem with its small-market owners, and it codified a lot of the welfare for them during the commissionership of one of their own (Selig). Look, there’s going to have to be a “floor” soon or things are going to get really ugly. On the upper end, I wonder whether the richer owners are regretting agreeing to the cap. The Bosox won the championship but have been really hamstrung this offseason because of the cap. The Yanks have signed a few FAs but no big-ticket ones, and the Dodgers and Cubs have almost sat out the offseason. Those are probably the four richest/most valuable franchises, and collectively they’ve spent very little this offseason, not because they don’t want to, but because of the threatened penalties. One of the real answers for leveling the MLB field would be revenue sharing of local TV contracts, but such a concept would be very difficult to sell to the richer franchises. The Cubs are said to be about to raise the stakes in this arms race with a deal with Sinclair. Anyway, since there are no local TV deals for the NFL, their teams have very similar pots of money available to them, and you don’t have a bunch of teams spending $100M+ less than others. That’s just an insane disparity that MLB accepts as a way of life. Remaining FAs: Boras is a common thread with a lot of these guys, including Harper, Keuchel, Marvin G., and Wieters off the top of my head. There may be others. Boras hasn’t read the evolving market well over the last couple of years, and he still decided to go for it full bore this year. Bryce turned down 10/$300 and may not end up anywhere close to it. As I noted in the comments on the last post, the initial quotes on Keuchel were insane — 6 or 7 years at $25-30M per — for a guy who already looks to be starting his decline. I think Wieters has more left in his tank than McCann does, and Wieters played his college BB in ATL, but McCann took the $2M from the Barves and has a job. Word at some point was that Harrison was wanting $7-8M and multiple years coming off an awful season. A lot of these guys are either getting bad advice, have an over-inflated view of their value, or both. Yes, the system undoubtedly is screwed up, but some of these guys are out of work in large part because they’ve failed the reality check. If Gio is still thinking he’s going to get $12M a year for several years, he’s failing it as well. Kimbrel has been kind of stuck because none of the big-ticket teams really need closers. The Bosox do need him back, but he’d put them in a higher tax-penalty bracket. And of course he didn’t help his case to be paid at the level his stats indicate he should with a shaky WS. I was really high on Buchholz as a cheap #5-6 for the Nats. Based on stats, for the time he did pitch in 2018, he was terrific. The fact that he’s still unsigned makes me wonder whether his late-season injury was more severe/lingering than reported. it is pretty obvious that Harper and Machado WAY overestimated the amount of money owners are now willing to pay for one player in the luxury tax era, especially when that player comes with enough baggage to fill a jumbo jet. One other thing of note is that the owners appear determined to stick it to Scott Boras once and for all. Last year, Boras client Mike Moustakis got thoutoughly hosed, and is now getting it again along with Harper, Kuechel and Marwin Gonzales. Boras has been responsible for pushing more bad contracts than other agent–and the Nats just had the Weiters fiasco to prove it. 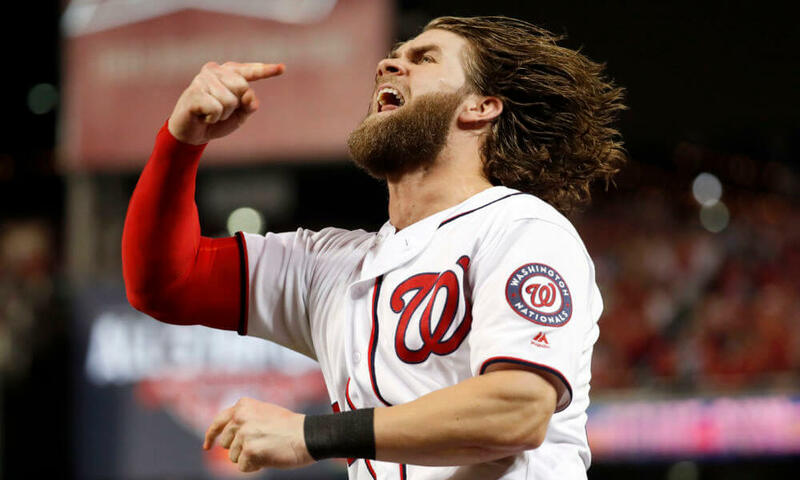 I also just saw a silly story on MLB.com that Harper has unfollowed the Caps on social media, which goes yet again to show what a petulant, immature jerk he is (no doubt he only started “following” the Caps in the first place because he was so heavily criticized for wearing a Predators jersey during the finals last year and demonstrably rooting against the home team). All the bad karma he whipped up over the past few years has now come back to haunt him, and it couldn’t have happened to a more deserving guy. I forgot that Moose is also a Boras client. He hit .251 last year with a 105 wRC+. You could probably get similar production from Mark Reynolds, who signed with the Rox for $1M. Earlier in the offseason, Boras might have been able to get Moose something like 4/$28M, which would have given him some security, but now, he’s going to be lucky to get the $5.5M he made in 2018. Again, there’s a fine line between an artificially repressed market and a reality check, or at least a market correction away from overpaying one-dimensional players. As for the Big Two, 10-year contracts don’t make sense for ANY team, even for 26-year-old players. They just don’t. There’s no reason/incentive for a team to give 10 years, all the more with a couple of opt-outs included, giving the player even more leverage. For Harper and Machado in particular, they’ve been hit particularly hard by the salary cap (luxury tax), as the teams thought to be their most likely destinations just aren’t spending big, as I noted above. So they’re left with the choice of undesirable location (Philly, Chisox) or compromising to end up with a better team or location. And for the record, I still think Boras will give Uncle Ted the chance to match any real offer he actually gets for Bryce . . . if he actually gets any. It’s curious/funny that Philly has been thought to be in play for a month, yet there’s never been word of any real offer. I’ll add that all of this is a reminder of just what a fantastic offseason the Nat front office seems to have had. Yes, one can quibble/fret about certain things (was seven years too many for Corbin? Was Rosenthal the best/right piece for the back end of the ‘pen?). But with limited cap space, the Nats struck early, got substantial players, and aggressively filled their holes. None of the other contending teams moved so aggressively. The Phils talked big, but they haven’t added much substance (yet). I’d be a lot more worried if they had spent their wad on Corbin, Morton, and a couple of hitters younger than Cutch. Now, even if they were to get Harper or Machado, they still haven’t/didn’t address their pressing need for at least two starting pitchers. The Nats did. They filled the holes they needed to fill, in starters, relievers, C, 2B, bench. So I give the Nats an A+ for effort. Can’t imagine how frustrated Cub fans must be over their team doing nothing. Perhaps I shouldn’t undersell the Phils getting Realmuto, although they gave up a good bit to do so. Still, they don’t have the starting pitching to win the division, and they’ve really neglected that area thus far. I’ll rest a lot easier when Harper signs with someone else. Agree with KK that he deserves his bad karma. I think he made it to 1 out of the last 4 FanFests, which was telling about how much he really cared about the fans. KW’s right, the Phillies don’t have the pitching and they are right now the 4th best team in the East. Maybe so, but they are the best 4th place team in baseball and the margin of error between 1-4 isn’t large. I think the Nats are a clear 1 on paper, but I don’t have to squint too hard to see the Phils next. De Grom or Syndergaard blows out, and the mets sink hard, I think. And the Braves? They are betting mightily that Donaldson is the guy from 3 years ago. If he is, then they’ll be tough. If he isn’t, then just be careful with Freeman and Acuna, and wait for the pitching to give you runs. But the Phils – that lineup is mostly young and has some staying power, even before one of the big two. Lots of rumors on TN that Harper met with Lerner without a deal, but it’s still hanging on. Really seems like the only ones going longish are the Nats and Phils, and he’s looking for a way to come back. I don’t even care any more, just ready for some baseball. I’m not a Harper hater, but I also won’t quibble with those who didn’t like his body language last season. His head was clearly elsewhere at times. Right now, though, I’m just ready for the Harper circus to be over, so the Nats and Nat fans can move on. Financially, it wouldn’t make a lot for the Nats to bring him back, although they would be a more dangerous team with him in the middle of the lineup and (presumably) content with where he’s going to be for the next few years. However, to have him parachute back in this late, and the Nats presumably have to try to trade Eaton for whatever they can get, would be a big disruption to the team. I don’t want Bryce in Philly, both because it would make the Phils much better and, well, because we already hate them. I’d be fine with him anywhere else. He’d probably be happier in SF, and make that team interesting, although probably not playoff-caliber. I assume the sticking point is that SF is offering less and/or fewer years than Philly. But who knows? And at some point, who cares? NL East: As I’ve said before, I’m shocked that the Braves haven’t done more this offseason. They’ve got the controlled young talent to give them some spending leeway and made a good profit off their new stadium and division win. But unless Donaldson gives them a full, healthy season, they’ve done nothing to improve. They desperately needed at least two starting pitchers, as did/do the Phils. The Mets have taken sort of the old Dan Snyder path to team building, acquiring some aging “name” guys, and sticking themselves with Cano’s big contract. They’re dangerous simply because of deGrom and Thor . . . if they stay healthy. And the Nats? Well, they checked all the boxes. They got the top starting pitcher on the market, as well as another guy coming off a fantastic season. Concerns? Honestly, the biggest one is whether their manager has the goods to hold it all together and properly handle the starts and the bullpen. There are still some unknowns with the ‘pen, particularly until we see how Rosenthal shakes out. Can Robles live up to his promise? Will Soto succumb to the sophomore slump? Can Dozier bounce back and give a real boost to the lineup? KW said :But unless Donaldson gives them a full, healthy [Wally: and 2016-level production] season, they’ve done nothing to improve. The other head-scratching thing about the Donaldson deal is that it displaces Camargo, who had a 116 OPS+ at age 24. There was no “need” there, and in fact they don’t have a good place to put Camargo. So they spent $20M to fill a hole that wasn’t there. I mentioned Kimbrel for the Nats earlier in the offseason, maybe even before they signed Rosenthal. If they’re going to blow by the tax line, honestly, that would be a heck of a bang-for-the-buck move. Add him to Doo and Rosey and that would be a powerful back end. I doubt the Nats would do it, but it’s fun to dream. I’m curious whether Rosenthal, a true 100-mph guy in his prime, has any advice to impart to wild flamethrowers Adams, Rainey, and Cordero. yeah agree, that’s why i said if he isn’t 2015/2016 Donaldson, it really doesn’t move the needle much. Like Harper wouldn’t be as big an uptick over Eaton as Kimbrel would. I doubt Rosenthal helps those guys. In today’s world, its common to see a 100 mph guy with little control. I am not hopeful. On the Donaldson contract; as others have noted basically he replaces dead money from the Kemp deal last year; the Braves have done essentially nothing, plan on spending the same amount in 2019 than in 2018 … how is this fair to taxpaying fans in Atlanta who just bought them a brand new stadium? Their payroll over last 3 years has bene amazingly consistent: $122M, $118M, $114M. What the hell? They’re in a huge market with their own RSN. At what point do fans call BS on basically lining the pockets of owners at the expense of ever-rising ticket prices, parking, and no investment in their teams? – Padres signed Hosmer 8yrs/$144M last year; why? – Rockies signed Desmond to 5yrs/$70M when they probably could have had him for half that.